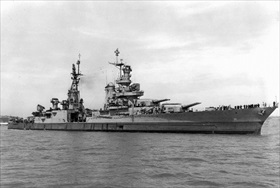 On this date in 1945 the USS Indianapolis, a Port­land-class crui­ser in Cali­for­nia for repairs, received orders to pick up a piece of special cargo at Hun­ters Point (prede­ces­sor name for the now-closed San Fran­cisco Naval Yard). Eleven days later, on July 26, the Indi­an­ap­olis delivered her mysteri­ous cargo to the B‑29 base on the Cen­tral Paci­fic is­land of Tinian in the Mari­anas. 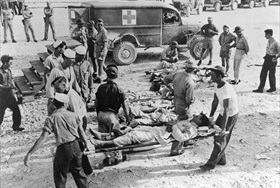 Four days later Japa­nese sub­marine I‑58 sank the Indi­an­ap­o­lis as the war­ship was en route to Leyte in the Philip­pines, inflicting the greatest loss of life in U.S. naval his­tory: 300 sai­lors were killed in the tor­pedo attack, and the remaining 800 bobbed in the un­for­giving sun and shark-infested waters of the Paci­fic for four days with­out the U.S. Navy being aware they were mis­sing. When at last they were spotted by acci­dent and rescued, just 316 out of the origi­nal 1,196 crew had sur­vived the sinking, exposure, dehydration, and shark attacks. Of course the Indi­an­ap­o­lis’ mysteri­ous cargo con­sisted of the key fis­sile com­po­nents for “Little Boy,” the code­name for the atomic bomb dropped on Hiro­shima on August 6, 1945. Developed by the Man­hattan Project headed by J. Robert Oppen­heimer at a cost of nearly $2 billion, “Little Boy” derived its explo­sive power (equi­va­lent to 15,000 tons of TNT) from the nuclear fis­sion of less than 35 ounces of ura­nium‑235. The Hiro­shima bombing was the second nuclear explo­sion in history, after the Trinity test near Alama­gordo, New Mexico, and the first ura­nium-based deto­na­tion. (The Trinity test occurred one day after the Indi­an­ap­olis left port for Tinian.) “Little Boy” killed perhaps 70,000 peo­ple out­right. With the deto­na­tion of the more powerful plu­to­nium‑239‑based “Fat Man” over Naga­saki three days later, which added 40,000 more deaths to the tally of the dead (to say nothing of the forever-maimed, the chronically ill, and the recovered wounded), nuclear weapons and their peace­ful off­spring exerted a profound impact on the rest of the twentieth century and into the present. Right: USS Indi­an­apolis’ survivors on Guam, August 1945. Torpedoed by Japanese submarine I‑58 on July 30, 1945, the Indianapolis rolled completely over and sank, bow first, within 12 minutes of being hit. About 800 of the 1,196 crew­men aboard ini­tially sur­vived the fiery sinking, although the ship’s life­boats—that is, those that cleared the vessel—could accom­mo­date few of them. Many of the men treaded water with­out life vests. By the time the sur­vi­vors were rescued four days and five nights after their war­ship went down, only 321 remained; four soon died. Most of the deaths on the Indi­an­ap­olis were due to exposure, saltwater poi­soning, and thirst, with the dead being dragged off by sharks.